It’s hard to believe that a year has passed since we wrote the story of Private Evan Davies. In a year’s time, maybe we will say the same thing again. For some, the years pass and the memories fade. For others, they are as fresh as the day they were encapsulated in time. On this Remembrance Day, we don’t want to forget anything for those we truly love. And that is one, possibly the most important reason, for writing Mindfully Bertie. Keeping memories alive. Not just of loved ones, but of times gone by. Childhoods. Unforgettable events. Always remembering that yesterday is history. Tomorrow is a mystery. So live for today. Proudly wearing Bobby’s knitted poppy. Here is last year’s Remembrance story. This is Bobby’s poppy. Knitted by Heather and sold to him by their mutual friend Amanda. And, most importantly, Bobby always donates each year to the poppy sellers, while wearing this rather special poppy for Remembrance Day. Modelled above by me. Knitted by Heather. Limited edition. 1,000. 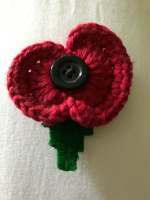 Diddley wanted a very special poppy and chose this enamelled brooch and ear rings. She would be delighted to know that they are in safe keeping with her granddaughter Layla. The story of the Unknown Warrior. As told from the Westminster Abbey website. Lighting a Candle to Diddley and to Private Evan Davies. As long as we write this blog, we will include this story each Remembrance Day. Private Evan Davies was Diddley’s great Uncle. She was unaware of his existence until recent years and then made sure she found out all she could. Bobby shared her interest in her forebear. This is her only photograph of Private Evan Davies’ grave. He came from the Yorkshire side of Diddley’s family. Born in Middlesbrough, where her family still live. He joined the Kings Own Yorkshire Light infantry; was sent to France and was killed at just 20 years old. On the Somme, with tens of thousands of other young men. 21 September 1916. From the gravestone, it was a simple job to search the War Graves Commission website and find details of where he is buried. Diddley was intent on going there. Sadly, she never made it. But, it’s our hope from this story that one of his great, great grandchildren will make that journey to France. Maybe with me and Bobby, and ensure that his memory will never be forgotten. You will see that there are New Zealand references on the gravestone. So many young men were killed that they were buried two by two. Evan Davies shares his with a New Zealand soldier, whose name is obscured by the wreath. A poignant reminder that this was a World War! The cemetery is Heilly Station in France. Full details are shown in last year’s story. St Martin’s in The Fields is our favourite place to Light a Candle. We light one there most weeks and every time we are in that part of London. It’s fair to say that we also enjoy the apple crumble and custard in the wonderful crypt café there! St Martin’s in the Fields. The Crypt Café. Best venue for apple crumble and custard in London. Remembrance of Private Evan Davies. About the Mindfully Bertie Blog. Joe’s Story – a Tribute.